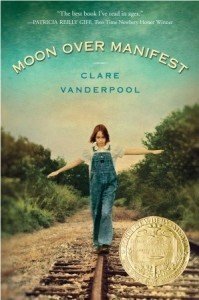 Twelve-year-old Abilene Tucker arrives in the dusty, underpopulated town of Manifest, Kansas, during the height of the Great Depression, sent there by her drifter father who for some reason thinks she needs to stop drifting. But why here, why now, is so unclear to her. What she wants more than anything is to be with her father, Gideon. Summer’s just starting, and she hopes to be back with her father by the fall. But … will she ever see him again? And what is his connection to this place? It seems the kindly preacher-man who takes her in, Shady, has an agreement with Gideon to take care of her. But she can’t find any other trace of Gideon, who said he lived there in 1918 and described a full, vibrant town. Then she finds Miss Sadie, the medium in the house at the edge of town. Or is she a medium? Miss Sadie’s stories of 1918, coupled with the occasional newspaper column from that year and letters home from a soldier in World War I, are fascinating but seem to have nothing to do with Gideon. Abilene and her girlfriends try to sort out the mystery of whether he’d been there and, if so, why he left. This is a tale that unfolds gently and slowly, like a flower. It has its plot surprises and a heart-stopping moment or two. I think it would have been a stronger story if the author had added more suspense and action. But I did enjoy it, and a reader who likes gentle stories will like it too. Does it promote mediums and that kind of hocus pocus? Spoiler alert! Turns out Miss Sadie has a natural gift of understanding, or “divining,” and that’s the source of her uncanny storytelling. So, no, the book does not promote mediums.